With Katie Couric lounging in the wings, Dan Rather is now expendable, and the suits at CBS News are squeezing him out of his last remaining gig on "60 Minutes." This has caused great distress for those who like their news to look like a long commercial for MoveOn.org, which is to say, the Dan Rather fan club. 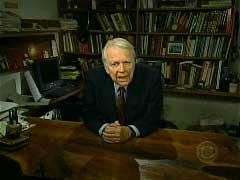 Yes this is a few days old, from this past Sunday’s "60 Minutes" on CBS, but Andy Rooney’s commentary on the show was so far out, it had to be shared with the Newsbusters community. The Dixie Chicks and their marketing gurus clearly know publicity. They asked themselves: How can we get ourselves featured on the cover of Time and hailed on CBS’s “60 Minutes” just before the new CD comes out? Easy. Trash George W. Bush again. In the wake of his gig at The White House Correspondents Dinner, Steven Colbert scored a profile on tonight's 60 Minutes. Andy Rooney Shills For a Woman President; Might That be Hillary, Andy? 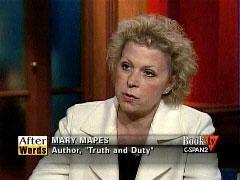 Mary Mapes: Rush Limbaugh Can't Lecture Me, That "Obese Drug Addict"
On his new blog over at U.S. News & World Report, cranky old liberal John Mashek (who earned the C.O.L. title for dismissing MRC's DisHonors dinner as "preposterous" a few posts back) reports from a media panel at Middle Tennessee State University. Playing the straight man to perfection, Matt Lauer kicked off the second half-hour of this morning's Today show by asking Katie Couric: "Anything new?" 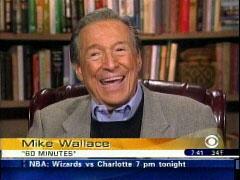 Longtime "60 Minutes" correspondent Mike Wallace has finally announced his retirement. His son, Chris Wallace, is host of "Fox News Sunday." On Wednesday both men appeared on "Larry King Live" to discuss the father's retirement and the son's ongoing career. In acknowledging Mike Wallace's semi-retirement, CBS News President Sean McManus handed out a bouquet of praise: "Mike has completely embodied what good, tough, fair journalism should be over the course of his 60-plus years in the business."